It's been one of the busiest week's in wearable tech in months with the Wearable Tech Show, Baselword, SXSW and GDC all taking place. PS VR will hit land in October 2016 for $399: the details were revealed at Sony's keynote at GDC on Tuesday; Nixon joined the Android Wear party with its new super-water resistant Android Wear debut The Mission; the Fossil Q Marshal and Q Wander were also announced at the Switzerland watch expo, as was the Michael Kors Access range. Below you'll find details on all the smaller stories of the past seven days. Take a read and you'll be right up to speed. Nike self tying laces. We've been talking about these for a while right? But they are finally happening. The Back To The Future sneakers are now the real deal. The Nike HyperAdapt 1.0 feature adaptive lacing that automatically tightens to your foot when your heel hits a sensor. "Innovation at Nike is not about dreaming of tomorrow. 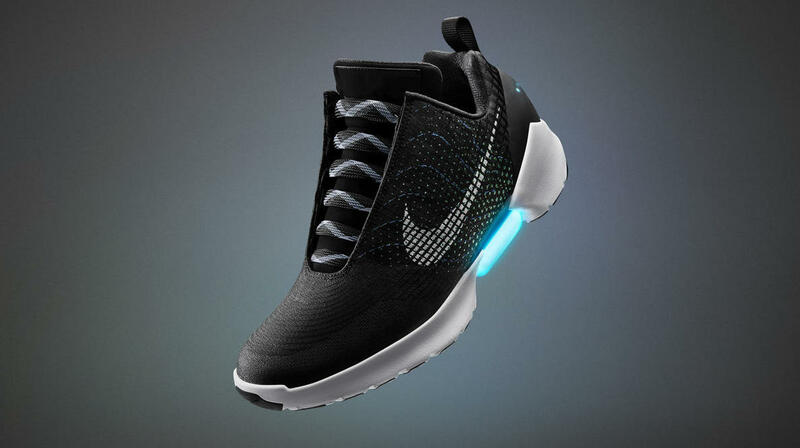 It's about accelerating toward it," said Nike designer Tinker Hatfield. "We're able to anticipate the needs of athletes because we know them better than anybody. Sometimes, we deliver a reality before others have even begun to imagine it." "In a motion to amend the original filing, Jawbone wants to add a new defendant to the case that formerly worked at Jawbone but defected to Fitbit, bringing a host of confidential information along with her. Jawbone also now contends that this person, along with previously named defendants, lied under oath that they had returned all confidential Jawbone information prior to leaving the company." You may remember that, back in October, Jawbone scored a victory over Fitbit when a San Francisco judge ruled in a preliminary injunction that former Jawbone employees breached their contracts when they left to join Fitbit. The judge ruled the employees must return all "confidential, proprietary information, technical data, trade secrets or know-how" and allow an independent audit of their computers and online files. Philips has readdressed the white balance of its Hue range by detailing new white ambiance bulbs that support multiple shades of white light: from cool daylight (6500k) to warm white (2200k). "Light impacts us both physically and emotionally, we experience this every day when waking up and going to sleep," explained Chris Worp, leader of Philips' home lighting business. "With Philips Hue white ambiance, we want to give people control of the impact that white light has on their wellbeing at home, particularly around day to day routines. By having every shade of white light at your fingertips, you can choose the perfect light you need to feel better, whether you want an energizing light for exercising or a dimmed nightlight for winding down to sleep." Check out our pick of the best smart lighting for your home. "Sky has launched a virtual reality film studio that will produce videos for Oculus Rift, Samsung Gear and online 360-degree video platforms." That's the word from Wired, who went behind the scenes this week. Its feature claims Sky is working on 20 VR productions, across F1, Sky Arts and Sky News. "The technology to film is there, the technology to view it on is there, and the platforms are there. What we need to do now is populate them," said Neil Graham, head of VR production at Sky.